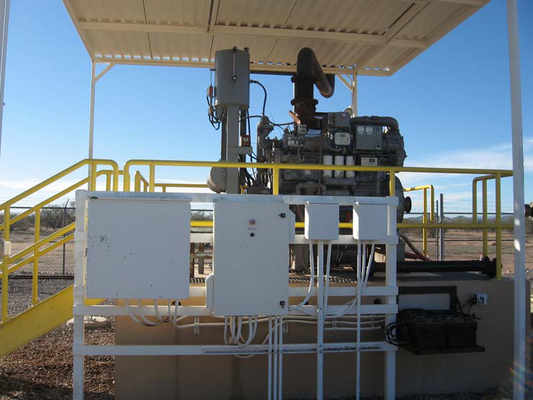 Unitronics distributor, MSI Tec, was put to the task of designing a panel to control natural gas engines at the City of Tucson's (population >500,000) well pumps. The control panels would need to be installed at 43 sites around the city. The cost per engine and shaft can be greater than $400,000. Rapid changes in RPM can cause a large column of water to shift up and down quickly and become a very expensive jackhammer, so the importance of a robust and reliable controller for these control panels was a necessity. The previous controllers that were used had screens that became increasingly difficult to read after a couple of years, which is why they needed to be replaced with a controller that had improved readability. Other necessary requirements were the ability to remotely connect to the customer's SCADA system, historical data availability- to diagnose possible causes of any issues that may arise- and an easy to use interface. "The Vision570™ was selected because of its ideal size, color touch screen, and terrific feature set for the price." Said Matthew Cronin of MSI Tec. The Vision570™s are mounted in un-insulated panels outdoors. Tucson's high temperature frequently climbs above 110 degrees (the record is 117 degrees), and the low often drops below freezing (the record low is 6 degrees). In the three years the panels have been installed, there have been over 250 days with the temperature above 100 degrees. Meanwhile, humidity ranges from an average low of 5% in June to an average high of 75% in July. The high quality of Unitronics' touch screens allowed them to be resilient to the temperature and sun exposure. "The temperature was so hot that we couldn't keep our computers running for more than 10 minutes...in the shade. In order to update the stations, we used cars with air-conditioned seats. We had to leave the cars running the entire day to keep the air and the seats cool enough for the laptops to not lock up. Even if there were multiple PLCs at a single station, we still had to go put the laptops in the car for a few minutes between each code download to keep the laptops running. Despite this excessive heat, the Unitronics kept running without a problem. And they continue to do so to this day." Said Cronin. 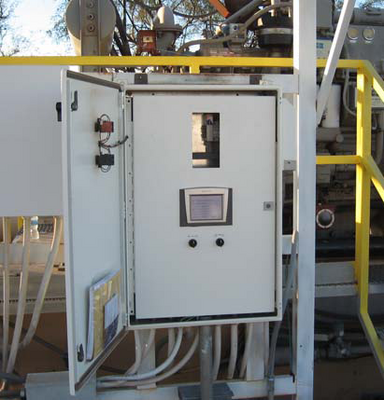 Using Unitronics' Modbus TCP functionality and a cell modem, Tucson Water's SCADA system is able to communicate with each well site individually. They are also able to use the V570's SD card functions to write data out every 1-120 minutes depending on user settings- which aids in problem diagnosis. The Unitronics V570 also provides an elegant and reliable 5.7" touch screen for a comparable price to the 2-line display system. Utilization of the touch screen system allowed for significantly easier interfacing. "After the systems were all installed, an upgrade was requested. They systems are not networked, so this required an onsite code change to approximately 40 stations...in July. Interesting hurdles were experienced during this upgrade, but none of them were because of the Unitronics." Said Cronin. "The Vision570 was the most cost effective solution for this application. By combining low cost I/O, communications, PLC functionality, and an HMI in a single package, Unitronics delivered more capability for less money. Because Unitronics is an all-in-one solution, programming is very rapid because no time is spent trying to get the HMI to "talk" to the PLC. This system required a diverse combination of analog inputs and outputs, digital inputs and outputs, and high speed pulse outputs. Unitronics had a flexible and affordable set of I/O cards to accomplish this."